Information Management/Data Governance is multi-faceted and the interconnections between the component capabilities are complex and not hierarchical. So I've come up withe following "Tube Map" approach to represent the network of different aspects of the IM/DG agenda and show how they inter-relate. 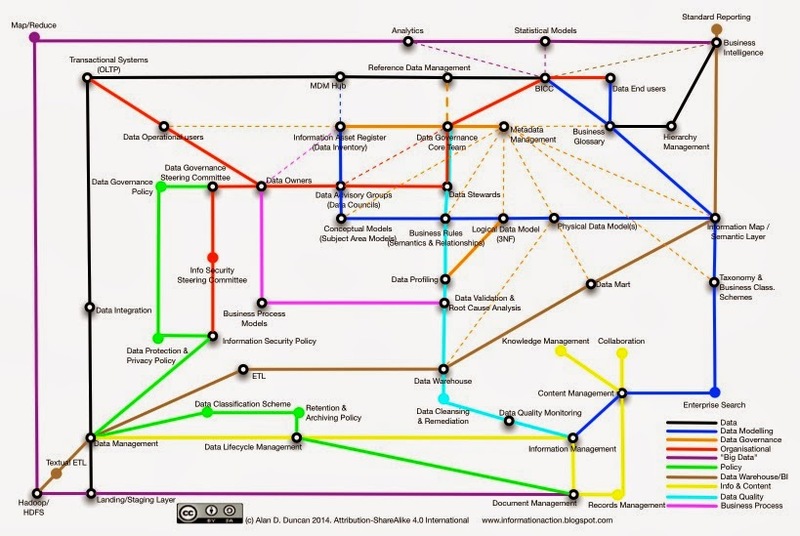 The “tube lines” represent different IM/DG competencies/capabilities, while the "stations" are indicative of more specific activities (and their associated deliverables or outputs). This is very much a work-in-progress and I’m not saying it’s perfect by any stretch, but as a “Information Management Tube Map Version 0.1”, I hope it stimulates some thought and offers some form of anchor point for navigating the intricacies of and Enterprise approach to Information Management and Data Governance. I’ll be developing this further as I go but in the meantime, please let me know what you think. I love this! I recently transferred positions within data management, and this allows me to explain to my management team what our dependencies are. What I have experienced is some areas become more mature than others. What I am trying to determine is .... how mature should you be to enable another. Thank you!! Many thanks for your feedback - I'm very glad you find the Tube Map useful! One of the consultancy services that I offer is a comprehensive capability assessment and Information Strategy & Roadmap planning. (This really needs to be done on advisory basis, as every organisation is at different stages of development. I find that there can't really be a one-size-fits-all Strategic Roadmap.) If you think that might be of interest, please email me at Alan.D.Duncan@gmail.com. This is excellent Alan, thank you for sharing it. Very interesting way of going through the complete topic. Thanks Alan for posting this.